Well, after some progressive tinkering with the facegen features of the game I've came to a halt and it gave me something pretty decent. 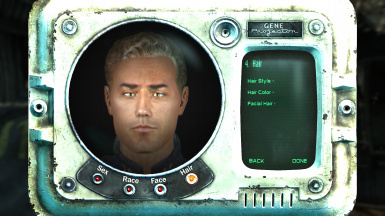 Facegen exchanger and Fallout 3 redesigned HD are highly recommended. Enjoy! As said in the small description, I've done some work around with the ingame facegen and it then came out pretty good-looking. I might do a female one too. Facegen Exchanger and Redesigned HD are HIGHLY recommended.